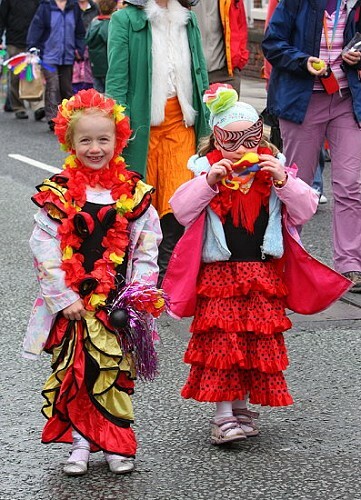 The Marple Carnival parade is a very important part of Carnival day. People line the streets to cheer the local groups and entertainment acts. It is also a great way to publicise you organisation or local business - for free! Try to arrange a working group of parents/members to help with the organisation – the more people to share the work the better! If children are to take part; remember you will need permission slips signed by parents/guardians. You will need sufficient adults to help with the supervision of the group on the day; especially ‘walking groups. Suggested ratios (OFSTED/DCSF guidelines) are: ages 5-8 years, 1 adult for every 4 children; ages 8 years+, 1 adult for every 8 children. Please try to encourage your ‘helpers’ to dress up and be part of your group. If you are walking; how about a dance routine? Think about having music to go with your entry. If you can’t play recorded music, how about percussion instruments? If you wish to take part with a float please contact local vehicle suppliers/haulage companies early to ask whether they will loan you suitable transport and a driver. Companies often provide their services ‘in gratis’ but ask for the volunteer driver to be given a small token for donating his/her time. Please ensure that appropriate vehicle insurance is held for using a float i.e. public liability (check with your/vehicle owners current policy supplier). Ensure that you have sufficient time to decorate your vehicle to go with your theme. It is often easier to make key pieces in advance and fix them to the vehicle on the morning of the carnival. This is a fantastic opportunity to promote your group; you will have several thousand people on the way round watching you pass by. Make a large banner to advertise your group – let everyone know who you are! Organise flyers to hand out to the spectators advertising your group/services. By completing this form you agree with the storage and handling of your personal details by this website. I consent Marple Carnival storing the data from this form. Please upload a PDF copy of your public liability cover and a completed risk assessment (also a PDF). The maximum file size is 1MB each. 2. Marple Carnival Committee reserves the right to refuse entry to any vehicle/ float/ group/ person which they consider to be unsuitable. In the event of a dispute the decision of the Committee is final. All entrants must complete the full processional route. 3. All vehicular entrants are to provide at least one marshal to be responsible for the safety of both the float and the watching public. 4. All entrants with children must provide sufficient adults to ensure the safety of those taking part at all times. 5. Collecting boxes and buckets will be at the parade assembly point and your help in collecting will be gratefully appreciated. All monies collected belong to Marple Carnival Committee and must be handed back to the parade assembly point at the end of the parade. 6. If you have any queries regarding the parade please speak to one of the Parade Marshals. 7. 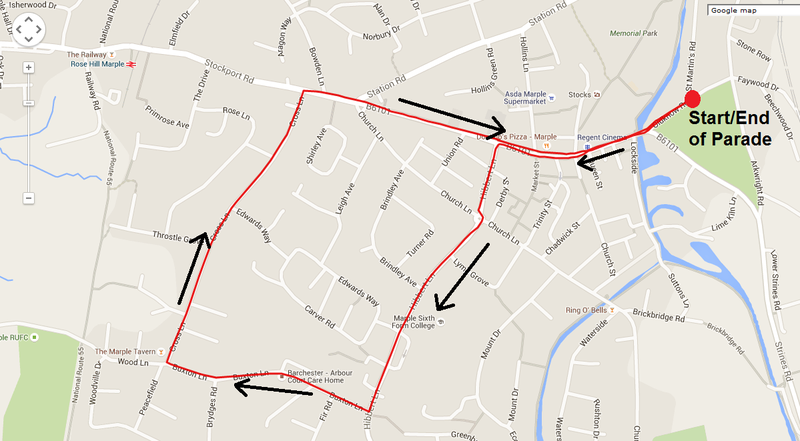 Marple Carnival Committee will not be responsible for any loss, damage or injury to entrants or property. Thank you in advance for considering supporting this community event.